168 pages | 12 B/W Illus. In late summer 2015, Sweden embarked on one of the largest self-described humanitarian efforts in its history, opening its borders to 163,000 asylum seekers fleeing the war in Syria. Six months later this massive effort was over. On January 4, 2016, Sweden closed its border with Denmark. This closure makes a startling reversal of Sweden’s open borders to refugees and contravenes free movement in the Schengen Area, a founding principle of the European Union. What happened? This book sets out to explain this reversal. 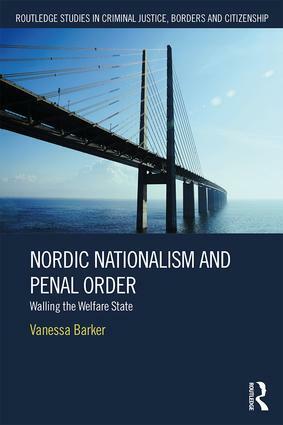 In her new and compelling book, Vanessa Barker explores the Swedish case study to challenge several key paradigms for understanding penal order in the twenty-first century and makes an important contribution to our understanding of punishment and welfare states. She questions the dominance of neoliberalism and political economy as the main explanation for the penalization of others, migrants and foreign nationals, and develops an alternative theoretical framework based on the internal logic of the welfare state and democratic theory about citizenship, incorporation, and difference, paying particular attention to questions of belonging, worthiness, and ethnic and gender hierarchies. Her book develops the concept of penal nationalism as an important form of penal power in the twenty-first century, providing a bridge between border control and punishment studies. "This book turns upside-down the assumed opposition between neoliberalism and welfarism by arguing that both are driven by internal logics of exclusion, assimilation and inequality. Developing a compelling theory of penal nationalism, Barker shows us how the criminalization of migrants is used to shore up nationalist agendas, identities, and resources. The example of Sweden – long identified as an open and humane society – underscores how penal power as manifested through border controls is central for understanding the logics of state power in the global north. Nordic Nationalism is essential reading for anyone trying to grasp the rise of global authoritarianism and racism in the face of mass movements of people around the world." "Nordic Nationalism and Penal Order is an important and timely book that provides a comprehensive analysis on how the internal logic of the Swedish welfare state has shaped an exclusion mechanism the author terms penal nationalism. Vanessa Barker’s book is a contribution to understand better the current Nordic border regime that targets non-citizens to be policed and excluded." "In a period of time when globalization has continuingly posed challenges and immigration is highly politicized in myriad countries around the world, mobility controls are critical research questions that entail innovative conceptual, theoretical and methodological approaches and tools. Barker’s new book has taken the research challenge and offered great insights into the recent penal upsurge in Swedish migration/border control. This book is a must read for those who are deeply concerned about issues of migration control, punishment and the welfare state as well as their connections with globalization and mass mobility." "Nordic Nationalism offers a comprehensive insight into the political realities of the external bordering of Swedish humanitarianism, and the internal walling of welfare rights. It documents the complexity of insider/outsider debates, and offers a jarring contrast in the concept of security, highlighting the tension between security for citizens and security for outsiders…. Importantly, Barker contends, ‘we have to ask what will be left that is worth preserving – a members-only club that depends on violence to keep others out’? With the current expansion of the immigration detention estate, coupled with unprecedented deportations and exclusions, this is a question that Nordic countries would do well to reflect upon, and with urgency." Vanessa Barker is Docent and Associate Professor of Sociology at Stockholm University, Sweden, and Associate Director of Border Criminologies. Her research focuses on questions of democracy and penal order, the welfare state and border control, the criminalization and penalization of migrants, and the role of civil society in penal reform.